Our individually wrapped, moist and crunchy Down Home Blueberry Muffin bursts with a generous helping of blueberries and is topped with a dome of crystallized sugar to offer a scrumptious taste in every bite. Prairie City Bakery Down Home Muffins are filled with mouthwatering ingredients and topped with crystallized sugar. 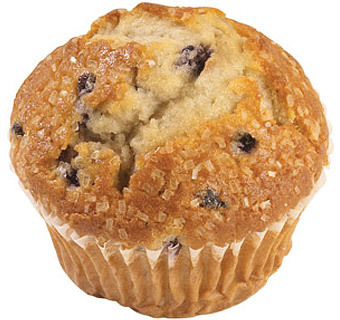 Moist and delicious sugar-topped muffins are available in five yummy flavors: Bursting Blueberry, Banana Nut Crunch, Cinnamon Crumbcake, Creamy Cheese Streusel and Chocolate Chip.